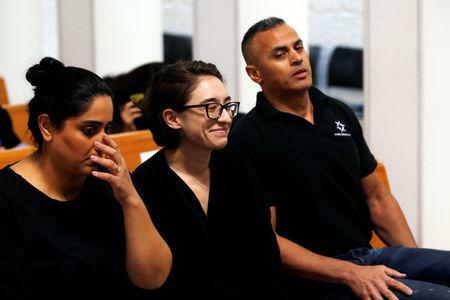 JERUSALEM (Reuters) - Israel's top court weighed an appeal on Wednesday by a U.S. student facing deportation under a law against foreign pro-Palestinian activists who call for boycotts of Israel. Alqasem's case has touched off debate in Israel over whether democratic values have been compromised by a 2017 law that bars the entry of foreigners who publicly support boycotts over Israel's policies toward the Palestinians. Alqasem, who is of Palestinian descent, has been detained at the Ben Gurion International Airport near Tel Aviv since being denied entry to the country. Jerusalem's Hebrew University, where she was due to begin a year-long master's program on Sunday, also urged the court to reconsider. At a hearing in Israel's Supreme Court in Jerusalem, Alqasem's lawyers said she was no longer active in the boycott movement and should be allowed in, the same argument made to a lower court that rejected her appeal last week. "Only someone who consistently and continuously calls for a boycott is somebody who should face a ban," Yotam Ben-Hillel, one of Alqasem's attorneys argued in front of the three justices. "She made a commitment to the (lower court) that if she enters Israel, she will not call for a boycott." The three justices hearing the case said they would deliver their ruling in writing. Leora Bechor, another attorney acting for Alqasem said she was hoping for a swift verdict, possibly later in the day. Prime Minister Benjamin Netanyahu has said Israel's stance is similar to other countries' practices. Israel's government has said it sees boycott movements not only as an attempt to isolate it over its occupation of territory which Palestinians seek for a state, but also as a campaign for its destruction. Alqasem's lawyers have said she stopped her activities in the Students for Justice group months before the anti-boycott law came into effect. Bechor said Alqasem could have opted to fly back to the United States, but had chosen to remain in airport detention to argue her case.